view all images (4) This is a rummy type game, but is played with cards. This type of game is popular in Asian countries. 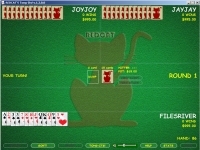 Tong-Its provides instructions about how to play. Interface is beautifully drawn and there are 3 players: one is you and other 2 are robots (the computer). You can create multiple profiles and save or load them independently.